All shipments sent from or received into India need KYC documents (Government recognized Identity and Address proof) to be presented to Customs during shipment clearance. Absence of these documents will mean clearance delay as shipments will go into Customs Bond until KYC documents are provided. The responsibility of the KYC documents are that of the entity based in India who can be either, or the exporter from India or the importer into India. DHL Express has provided the entity in India with an easy method of uploading the the necessary documents at www.dhlindia-kyc.com from your desktop or smart phone. The below table provides more information about KYC documents required for shipment customs clearance. 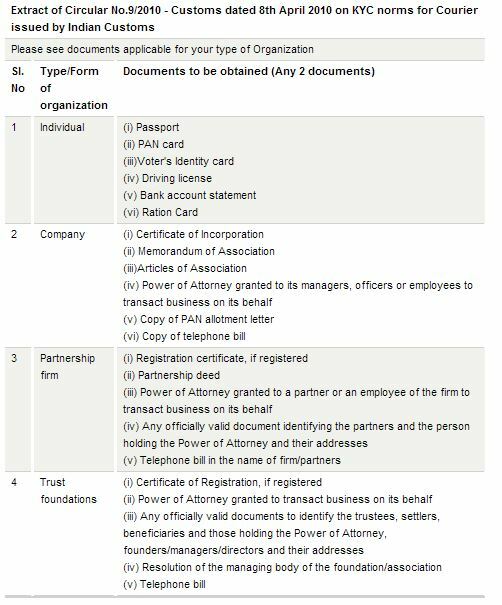 As the entity in India, refer to the type of document that you need to submit based on the type of your organization – in the table below. For more information DHL Express has provided an information page. When do I need a NAFTA Certificate of Origin? Which countries are currently under embargo by the U.S.?